Welcome the next segment of Stashmycomics.com’s Stash My Toy. This month I am bringing the new series of DC’s Action League mini-figures: Green Lantern Kilowog and Red Lantern Zilius Zox. Also released in this series were Wonder woman and Superman, Batman and Deathstroke, and Saint Walker and Hal Jordan. I picked up the figures for $5.99 (US).This line of figures makes nice show pieces in the office or study area to show off your comic book nerdiness, because of the fact they are so tiny. 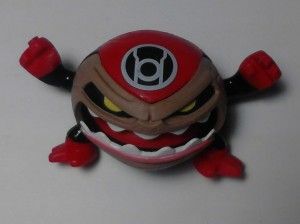 First in this package let’s look at Kilowog. Kilowog is definitely the biggest figure in the line and weighs a few ounces. You could do some damage with this small figure through a window. Kilowog is 3 inches (7.6 cm) high and 2 ¾ inches (7 cm) from shoulder to shoulder. He has your typical Green Lantern outfit on. This figure is really top heavy, but they gave it a nice foot base, so he has a nice balance. He has 3 points of articulation at the arms and waist and they are tight too. The detail on this figure is perfect it does not get too complicated, nicely animated with four colors (green, flesh, black, and white). Next, we have the Red Lantern Zilius Zox. Being the shortest figure in this line of figures, he comes in at a staggering 1 ½ inches (3.8 cm) tall. Zilius’ width from arm to arm is 2 7/8 inches (7.3 cm). This figure is one of the weaker figures in the series because of his size. The pros of this character are he is sculpted very nicely and the color scheme is great (red, white, black, flesh). 2 points of articulation were given to his arms and nothing else. The biggest disappointment of this figure is he does not want to stay up. Its base (footing) is so tiny. Bring on the vibration on any surface…and he rolls over like a coward over the tabletop and then to his death to the floor. This is quite annoying. I suggest when you have a figure who is afraid to stand up on his 2 feet put some Velcro or sticky tack on the bottom of their feet so they stand up. Overall I enjoyed these two figures. 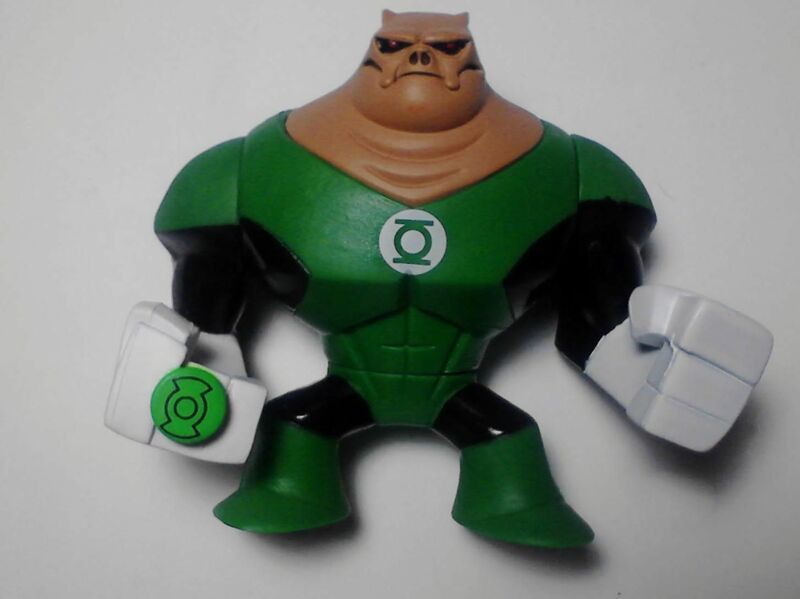 Kilowog is definitely one of the stronger figures in this series. One of the better things with this series is that they overproduced the line, so you collectors out there will be able to find them almost anywhere. I am estimating within the next few months the buyer is going to find these in the clearance isles, so keep a look out. This ends our 2nd segment of Stash My Toy column. Please leave your +/- feedback to let me know how you, the reader, is enjoying the column. Be here next month for our next awesome figures I bring to the universe of Stashmycomics.com community. Remember to come to Stashmycomics.com for all your comic book needs. I was always a big fan of non-poseable figures. Shame I don’t have enough space to store (let alone display) them. These are tiny. I like to put them in the center of my dashboard in the car. 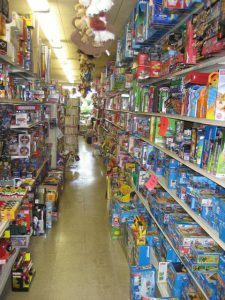 I didn’t realize there was a Stash My Toys column. My bad, Steven! I enjoy this. Keep it up! Just started. Hopefully it gets good reveiws and likes from everyone. This is my first attempt at blog writing. So be kind. Yeahm pretty much I plan on going back to buying 1 figure a month to write the column and bringing coming soon toys to the table. I like the Marvel Universe line, myself. I mean, I like the Iron Patriot action figure I have, anyway. Lots of articulation, which is kinda nice, but mostly it’s that some of the less obvious characters (or, at least, less obvious presentations of the characters) show up. Iron Spider-Man and Planet Hulk-style Hulk, for example. $7-8 ain’t bad, either. One second, is it possible to ‘stash’ our figure collection? Or is this just a column? I’d love to be able to do that!!! We have some figures already entered, and currently you can request new entries via the new comic submission link.